I am the current secretary for the Association ( HMS Prince of Wales and HMS Repulse Survivors Association), having taken over the role when my father, Kenneth Byrne passed away. 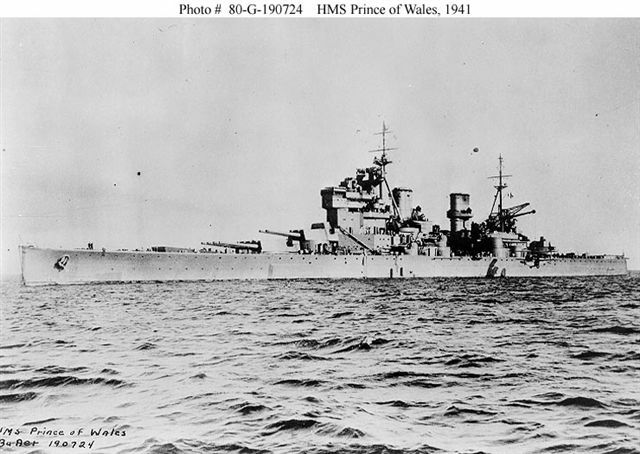 My father served on HMS Prince of Wales and was 17 years and one month when the Prince of Wales was sunk; his friend was the same age but did not survive the sinking and still lies with his ship. This is something my father never forgot. Some people have suggested that most survivors do not own a computer or have access to the Internet. They are wrong. My father had his first computer at the age of 75, Internet ready. Most survivors have children, grandchildren and great-grandchildren who own computers and are able to simply type in HMS Repulse to a search engine. It is surprising what turns up. Some of the items on websites are very distressing as they contain images of human remains. I had the pleasure of meeting the late Shirley Ward. Her father Frank served on HMS Repulse, she was a baby when her father died. His final resting place is HMS Repulse. Shirley was one of the first persons to inform the association of the activity of divers on the wrecks. When I see a photo, clip of a film on the Internet, for all I know I could be looking at the remains of Shirley’s father, for that matter a father or grandfather of another member of the Association. When you have met these people personally you see a different picture. What should the association do, keep quiet or to work to try and protect the final resting places of hero’s who died fighting for their country, some of whom were only boys? I have a duty to report to members anything that is brought to my attention. The matter was again on the agenda for the AGM this year. Again the members voted for the Association to continue to campaign for changes in the law to stop divers entering the ships. This is what we shall do. Please don’t get me wrong, we do not want to stop divers visiting the ships, But please do not enter. Please do not disturb the final resting place of these men. We don’t just want this for HMS Repulse or HMS Prince of Wales, we would like this for all maritime war graves, what ever their nationality. If the law is not changed and international agreements set in place, one-day divers will be in HMS Hood and the Bismarck. The Association wants protection for every war grave whether on land or at sea. Hannah Rickard, Association Secretary. (Daughter of Ken L Byrne, former crew member of HMS Prince of Wales). Australia has enacted The Historic Shipwrecks Act 1976, but as I read it, this act does not preclude any entry into sunken wrecks by Divers who have a permit to dive upon a specific wreck covered under this Act. Australia's historic shipwrecks form an invaluable, limited and irreplaceable resource. The Historic Shipwrecks Act 1976 , which is administered by this Department, protects historic wrecks and relics in Commonwealth waters, extending from below the low water mark to the edge of the continental shelf. Each of the States and the Northern Territory has complementary legislation, which protects historic shipwrecks in State waters, such as bays, harbours and rivers. Under a declaration made under the Historic Shipwrecks Act, all wrecks which are more than 75 years old are protected, together with their associated relics. The Minister for the Environment and Heritage can also make a declaration to protect any historically significant wrecks or articles and relics which are less than 75 years old. The Act aims to ensure that historic shipwrecks are protected for their heritage values and maintained for recreational and educational purposes. It also seeks to control actions which may result in damage, interference, removal or destruction of an historic shipwreck or associated relic. Divers can use wreck sites for recreational purposes but relics must not be removed from the wreck site and the physical fabric of the wreck must not be disturbed, unless a permit has been obtained. Some historic shipwrecks lie within protected or no-entry zones. These zones may cover an area up to a radius of 800 metres around a wreck site, and may be declared where circumstances place it at particular risk of interference. This declaration prohibits all entry into this zone in the absence of a permit. Permits are also required to undertake any activities otherwise prohibited or restricted by the Act. Anyone who finds the remains of a ship, or an article associated with a ship, needs to notify the authorities as soon as possible, and to give them information about what has been found and its location. Historic shipwrecks and associated relics do not automatically belong to the individuals who find them. The transfer, possession and custody of material such as relics, including coins, from historic shipwrecks, are also regulated. Historic shipwrecks and their associated relics are protected even if you came into possession of this material long before the Historic Shipwrecks Act existed. The Act is administered by the Australian Government in conjunction with Delegates in each of the States, the Northern Territory and on Norfolk Island. To find out information about permits and protected zones, you should contact the Commonwealth Historic Shipwrecks Officer, or the Commonwealth Minister's delegate in your State or Territory. The Act also requires that a register of historic shipwrecks and relics be maintained.